In the heart of Limburg, spread over seven municipalities, lies the country of 1001 ponds: the 'Wijers'. Ponds of all sizes, with hundreds of water birds, are a paradise for the true nature lover and provide a breath-taking backdrop for hikers and cyclists alike. However, cultural-historical parks and the major tourist attractions are also full of life here. It is this combination of nature, tourism and culture that makes the ‘Wijers' so unique. You can discover this area through the various starting points . The ‘Wijers’ includes the municipalities of Hasselt, Genk, Heusden-Zolder, Houthalen-Helchteren, Zonhoven, Lummen and Diepenbeek. Whether you’re on foot or by bike through the water,you will see the ponds – we call them ‘wijers’ – everywhere. They were created under the impulse of the abbey of Herkenrode, when the nuns used the ponds to grow fish. Later, commercial fish farmers came into the area, some of whom are still active today. Fish farming is, therefore, inextricably linked to the region. The ‘Wijers' is an area of outstanding beauty, even on a European scale. In fact, it is so important that large parts of it have been included in the Natura 2000 network,which means that it is given additional protection by the European Union. The water landscape is home to many rare animals and plants, including the bittern- a mysterious heron-like bird - and the tiny tree frog. Without the ponds, reed beds and heather in the ‘Wijers’, species such as the bittern, little bitter nor tree frog may have been extinct in Flanders by now. 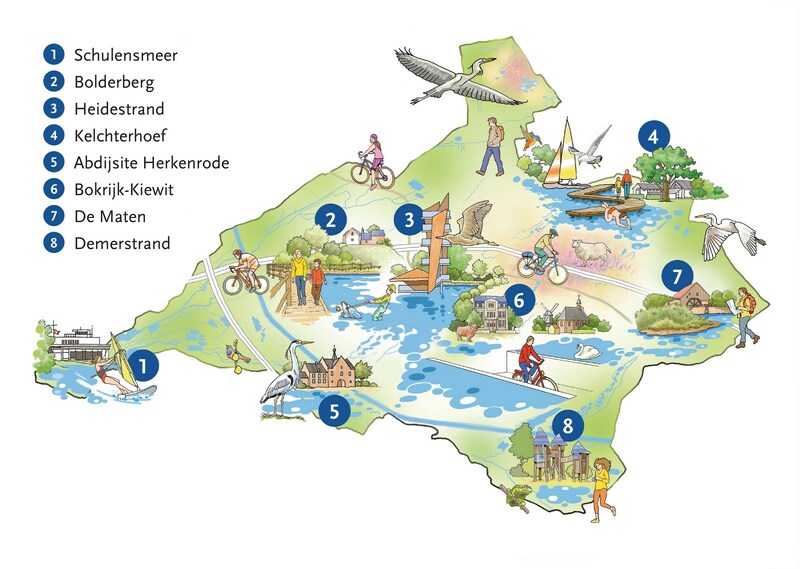 In 2004, the Regionaal Landschap Lage Kempen vzw brought together various partners and sectors to initiate an area-specific approach to the GLE project 'Opportunities for the central Limburg pond area' with the support of the province of Limburg. In this context, the Wijers Platform was established. During this process, the partner organisations ensured they were all on the same page and decided to develop the ‘Wijers’ together in a sustainable way. 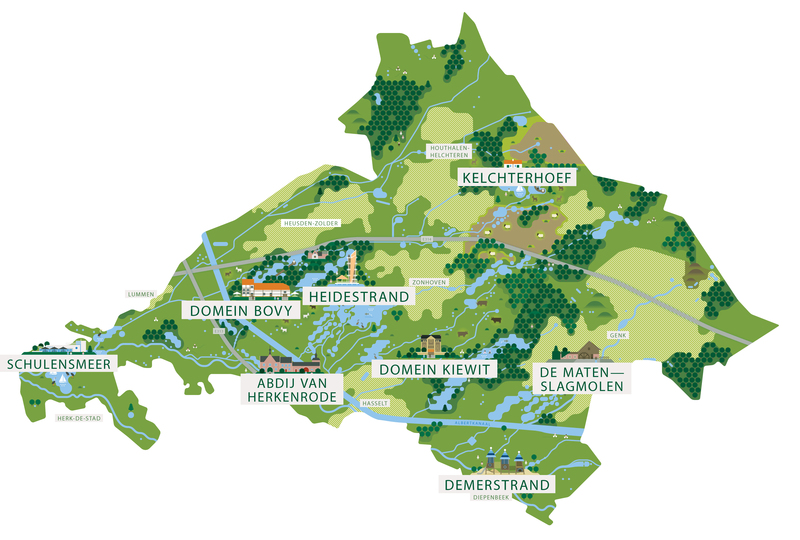 In 2007, the ‘Vlaamse Landmaatschappij’ [Flemish Land Agency] took over the pioneering role of Regionaal Landschap Lage Kempen and was tasked with the coordination of the rural project the 'Wijers'. In order to maintain, and indeed reinforce, the assets of the ‘Wijers', 14 partners started the ‘Wijers’ project together in 2008-2009. In 2010-2011, three more organisations joined the group. With the project, these 17 partners want to safeguard the future of the ‘Wijers'. Within the framework of an integrated rural development project of the ‘Vlaamse Landmaatschappij Limburg’, a baseline vision was developed that is intended to serve as a coat hook and hotbed for the development of initiatives and ambitions in the region. The intention is to work together with a broad group of stakeholders to develop this vision. In 2017, the ‘Vlaamse Landmaatschappij’ transferred the general coordination of the Wijers project to the province of Limburg, which - together with the 17 partners - will further expand and develop the ‘Wijers'.